If you are looking for a fun yet educational game for toddlers and preschoolers, Racoon Rumpus is for you! Raccoon Rumpus is a game by Educational Insights. Designed for ages 3 years old and up, it’s a game that teaches colors, matching, and memory as players try to dress up their raccoon. Educational Insights sent me this game to review as part of my Holiday Gift Guide. Each player is given a raccoon who is only in his or her underwear (my kids thought this was hilarious). 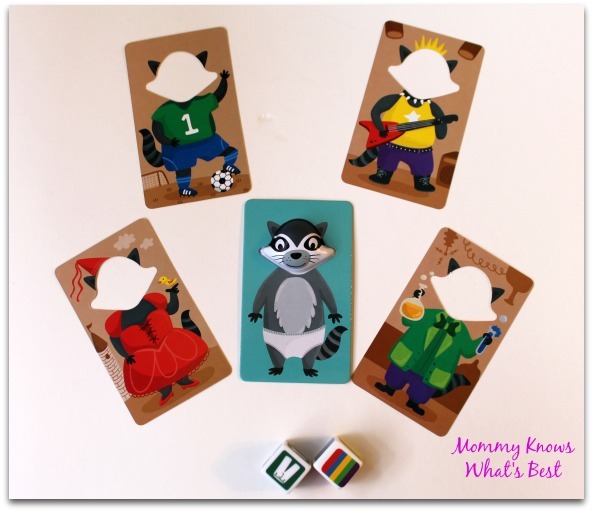 Cards with colored raccoon outfits are spread across the table so that everyone can see. The cards will be used to dress up the raccoon! The youngest player goes first by rolling the dice, which has colors and pieces of clothing on each side. The player must find a card with the matching clothing and color. The goal is to have the most outfits on your raccoon when all of the outfits are gone. But there’s a catch! The dice also has a side with just underwear on it. If a player gets that, then he or she must remove all of the outfits on their raccoon and start all over! This game is really cute and original (at least to me!). The kids loved the concept of dressing up their raccoon in a variety of fun outfits. It’s both fun and educational. The kids practice colors, matching, and even memory (the outfit cards can also be placed face down and the kids have to remember where they are). There are very few small pieces. By very few I mean two: the dice. Nothing irks me more than a game with a thousand tiny pieces! Make it more than 2-4 players. This game, when played with just two kids, can go rather quickly. With three or more players, it seems to last longer. Throwing the dice can be tricky for little hands. Little hands like to throw things pretty far. I remedied this by using the box lid and having the kids drop the dice in there. 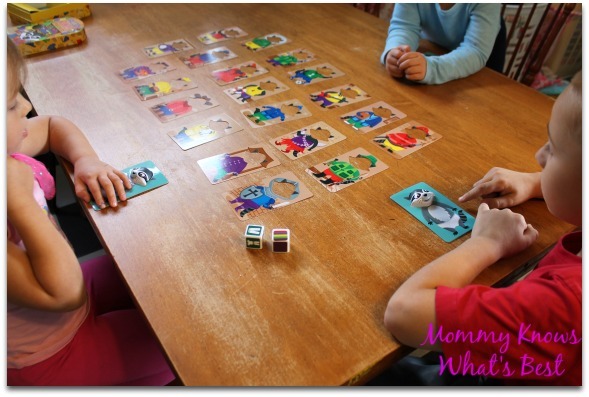 This game would be a great gift for any toddler or preschooler. My kids, ages 6 and 3, and my 4 year old niece, give it two thumbs up! Thanks to Educational Insights for sending us the game to review! 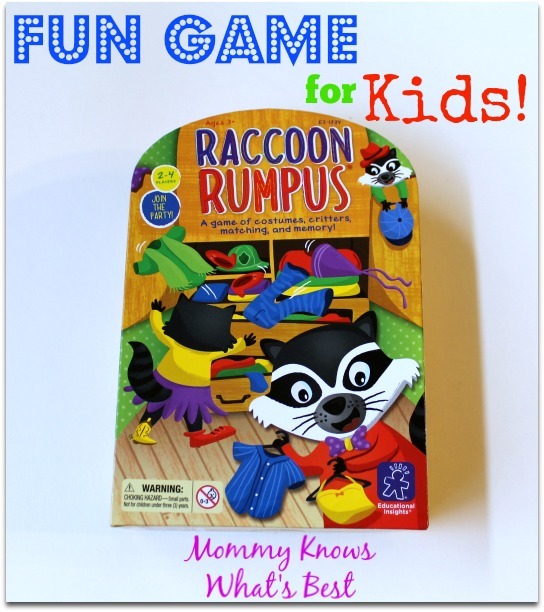 Raccoon Rumpus can be found on Amazon, along with other great games from Educational Insights. 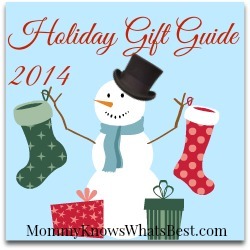 Find more gift ideas in my 2014 Holiday Gift Guide! This game looks so fun and is absolutely perfect for my 4 year old nephew! I always look for games and toys that are both fun and educational and this one really looks like it accomplishes both. Thanks for sharing! Looks like a fun game my girls would enjoy! Shelby’s snack shack looks fun and about right for my son! 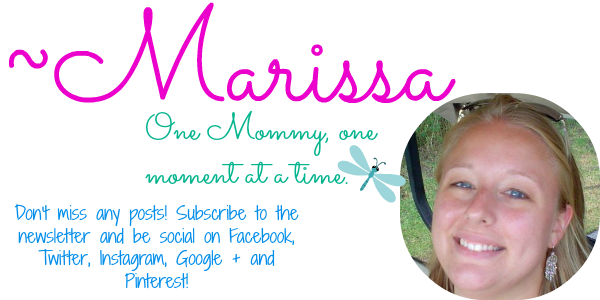 This is really cool came for little ones! This game looks so fun–my son would really enjoy it!